Later on he entered the Conservatoire à Rayonnement Régional of Lyon where he undertook his studies with the well-known Peruvian artist Jesus Castro-Balbi finalizing with a gold medal for unanimity. He studied in Austria for two of his Master's degrees, at the Mozarteum in Salzburg with Prof. Eliot Fisk and Klagenfurt Conservatory with Prof. Marco Tamayo, and for a Postgraduate at the Vienna University of Music and Arts with Prof. Alvaro Pierri. Lazhar won several awards in international competitions or festivals such as the first prizes in Petrer, Sevilla, Llerena, Fiuggi, the prestigious Pittaluga Competition and the Segovia Prize at Música en Compostela. He also as 3 CDs on the market: Récital by Integral Classique (France), Soirée dans Grenade Iberia Classic (Spain) and a Naxos CD for the Laureate Serie. Currently he is developing a pedagogic and artistic career in Zurich (Switzerland), where he finished a Master’s Degree in Pedagogy of Classical Guitar with a minor in Jazz Guitar, and serves as an intern instructor and coach at the Zurich University of Arts. Lazhar was selected to fill the guitar teaching position at the Zurich Conservatory School of Music and several other schools in the area, where he teaches in 6 different languages. He teaches as well regularly at Oklahoma City University (USA) as an Artist in Residence and works as an Pedagogy Expert for the Guitar Division at the Bangalore School of Music (India). He plays a Paco S. Marín and a Simon Marty, serves as a consultant for the luthier Juan Menduiña in Madrid and is endorsed by Savarez Cantigas. 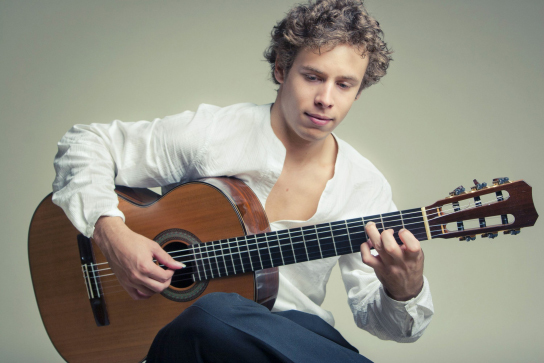 As well, he receives support from the Banque Populaire and the French Lion’s Club after winning the first prize of its European Guitar Contest in 2011.